According to the official words the new Apple iPhone 5 will be a stunning experience. 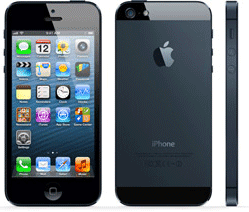 Apple iPhone 5 comes with a brilliant 4 inch retina display with 1136 x 640 pixel resolution at 326 pixels per inch. The dimension of the smart phone is 4.87 inch x 2.31inch x 7.6 mm and the weight is 112 grams. Considering the width figure (2.31 inches) Apple iPhone 5 is the same width as Apple iPhone 4S. It is to give more comfort to handle the handset with single hand. The stylish retina display covered and protected by Fingerprint-resistant oleophobic coating. Apple climes that iPhone 5 is 18 percent thinner, 20 percent lighter and 12 percent less volume than Apple iPhone 4. So the smart phone will be the thinnest and lightest design Apple ever made. The smart phone powered by the latest A6 chip set with inbuilt graphic acceleration.